If you have been following our posts and videos on our progress towards bringing you pit-to-car alerts, you’ll know we’ve been hard at work on this big new feature for RaceCapture and Podium. Good news: it’s ready for you to beta test! The new alert and warning system vastly improves the old two-threshold gauge coloring scheme by switching to a powerful rules-based engine. Now you can define multiple thresholds and actions to control gauge color, popup messages, and in a future release, control of the ShiftX2 and ShiftX3 sequential shift light and alert LEDs. We need your feedback! Once you’re in the middle of testing, post your feedback in the AutosportLabs Facebook community or the Autosport Labs Forums. Google Play: Opt in to the beta testing and install 1.14.2. Note, you may need to un-install the current production version before you can install 1.14.2. Kindle Fire: Amazon does not provide a beta testing mechanism, so you will need to un-install the current production version, then download and install the .APK manually. iOS: Due to Apple’s deployment process the iOS version is delayed – we will follow up when it is available. Note: un-installing the app also erases any saved logging sessions – so export any sessions you want to keep before proceeding. If you’re using the on-board cellular, you will need the beta 2.14.0 firmware installed. Get the Beta 2.14.0 firmware for your device. Make sure you get the firmware that matches your hardware. Update the firmware via the usual mechanism, and be sure to save your configuration before updating – since this is a minor version upgrade (2.13 -> 2.14) and will cause a reset to factory defaults. If you’re using the app to broadcast telemetry, you’re good to go with the current firmware – everything is enabled via the new features in the 1.14.2 app. Navigate to your dashboard and press the ‘customize’ on an existing gauge. Instead of the simple color thresholds editor, you are now presented with the rules editor. Press the (+) to create your first rule, and one or more actions – such as color a gauge, or create a popup alert. You should find the rules flexible enough to meet most alerting / warning requirements. Note, the Shift Light and LED alert actions are present in the list of actions, but have no effect, yet. After updating the app and possibly firmware, start a telemetry streaming session. Reload the page with this updated URL and you will see the Messages box above the list of laps. Navigate to the dashboard on your device, then enter a short message (max 16 characters) to be sent to the car and send. Once it sends, you will see it pop up on the screen. Press the X button on the popup to dismiss – you will see an “OK” as a response to your message on Podium. To ask the driver a question, append a ? to the end of your message. The driver will be presented with a X or Check icon – which responds as NO or YES, respectively. Once we feel pit-to-car alerts is ready for production, we will enable it on globally, without requiring the ?am=1 on the URL. For those of you who don’t have touch sensitive gloves such as the Sparco Arrow RG-7 EVO you can modify your gloves fairly easily for touch screen operation. AnyGlove is a treatment that allows gloves to be touch screen compatible. Weave a few strands of conductive thread in the index finger to easily make your gloves touch screen compatible. If you’re a bona-fide race car hacker then you’ll know that you can modify a bluetooth keyboard to send keyboard commands to the app – such as left / right arrow to switch screens, in addition to sending ESC (No) or Enter (Yes), and then wire the buttons to your steering wheel or other convenient location. We know hard buttons are important, and we will provide better support for this in the future – without you needing to be a race car hacker! Thank you for testing and your feedback. Be sure to drop a note in the AutosportLabs Facebook community or the Autosport Labs Forums with your feedback and hopefully a demo video! 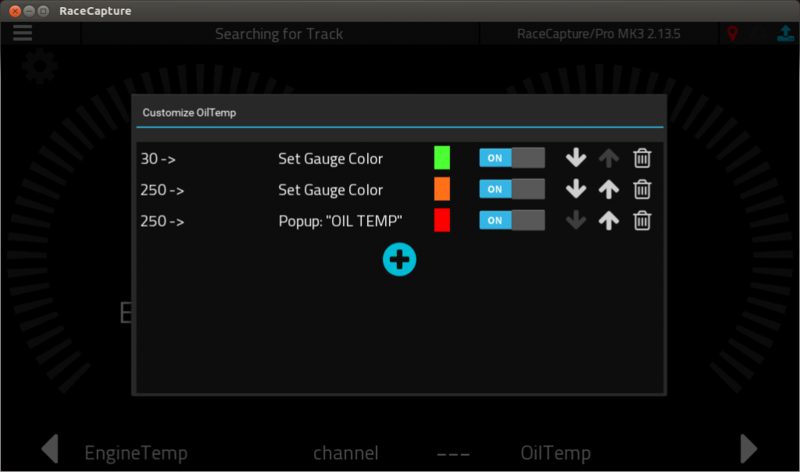 PodiumConnect 2.13.9 firmware released – upgrade before your next race!